Qianmen Gate (Front Gate) is the modern name for the gate south of the Forbidden City and Tiananmen Square (Beijing), originally named Zhengyangmen (The Gate of Straight Positivity). It was built in 1420 in the early Ming Dynasty. 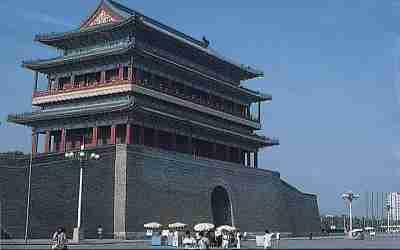 Qianmen rises to a height of 42 meters which made it one of the tallest buildings in ancient China. It is the best preserved ancient tower still standing.